What a shame. 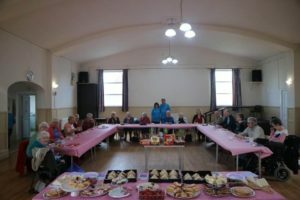 The purpose of this post is to confirm that last month (March 2019) our Tuesday Club met for the last time. We were sorry to see it go – there they all are lined up for the camera. But we’re delighted that just about everyone is going to stay in touch with us via another of our groups/clubs. As they say, “when one door closes, another usually opens”. This is a shame. The number of people regularly attending our Tuesday Club has fallen to a level that makes the club unsustainable. It is therefore with regret that the club will close down at the end of March 2019. We hope regular members will stay in touch by attending one of our other groups. And we would like to say a big ‘thank you’ to Keith and Heather Silverthorne for all their support to this club. To everyone visiting our site – happy New Year! If you’d like to get involved with us – either by joining one of our groups, or volunteering to help run a group – please use the Contact Us form. We’d love to hear from you. The CrossLinks Trustees and volunteers wish everyone visiting this site a merry Christmas. One of the reasons we do what we do is because we are Christians. For us, Christmas is partly about mince pies and kiddies presents, and so on. But more significantly it is about setting time aside to acknowledge that God sent his son, Jesus, into the world to show us all how much he loves us. We hope – and pray – that over the Christmas period and into the New Year you will sense something of God’s love for you. And we’ve added a ‘Contact Us’ page where you can send us an email – we’ll get back to you ASAP. Don’t forget we’re on Facebook too. That’s where you can continue to find our headline news, and some piccies of what we’re up to.